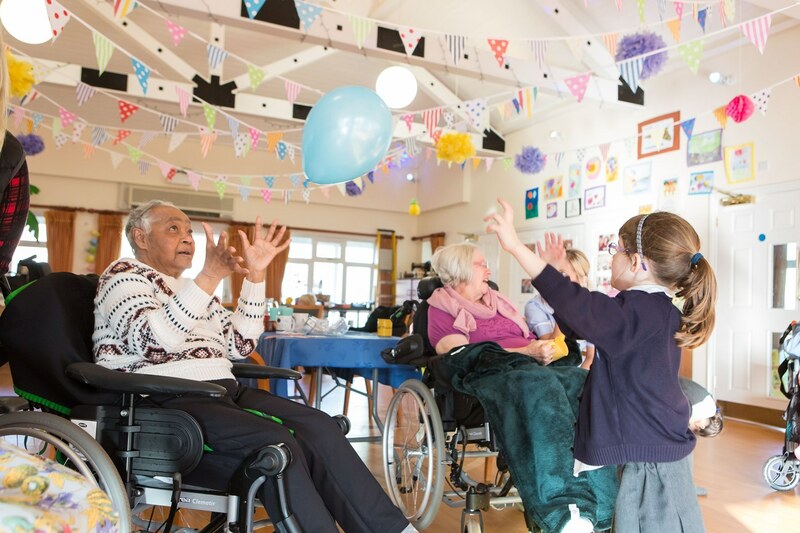 Primary school children and residents living with dementia are bridging the generation gap by playing games, doing arts and craft and learning about one another’s lives. 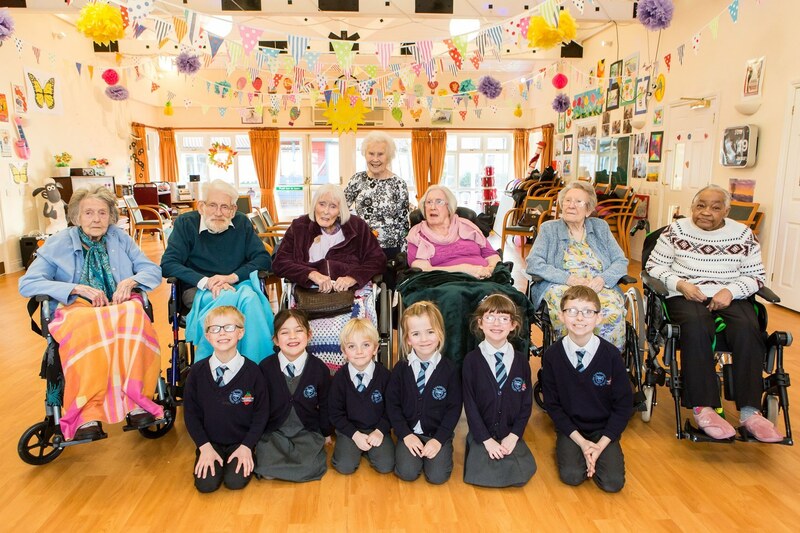 Inspired by the TV show, Old People’s Home for 4 Year Olds, Year 1 pupils from Sandford Primary School have been visiting residents at The Russets dementia care home. The visits were started by Teaching Assistant, Tracey Shears after watching the hit Channel 4 show when it was broadcast last autumn. “Seeing the pleasure that both age groups got from taking part in the TV show was the inspiration for me to arrange similar visits between our pupils and residents at The Russets,” said Tracey. 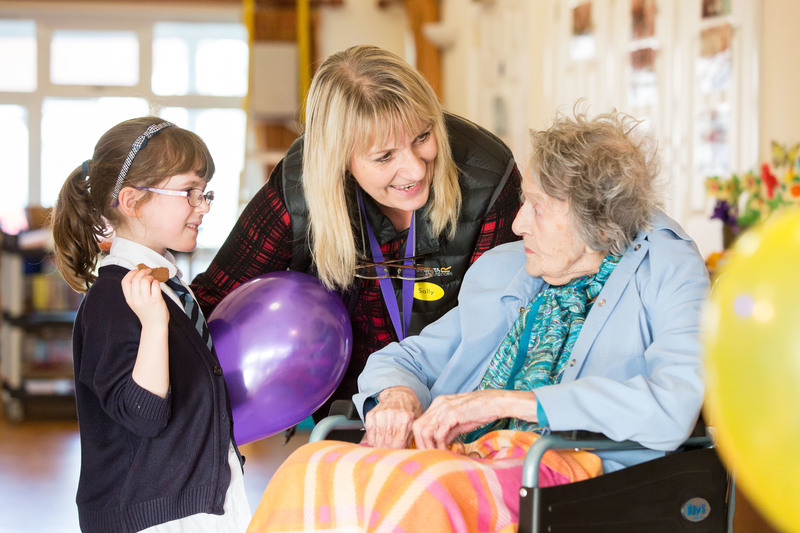 Old people’s Home for 4 Year Olds was filmed by CPL Productions at the Trust’s Cote lane retirement village in April and May of last year. The award-winning show brought together eleven St Monica Trust residents and ten children from local Bristol preschools for a six week period to prove scientifically that the two generations could transform the physical, social and emotional wellbeing of the older volunteers. Tracey said: “The residents really look forward to the visits and as soon as they see the children arrive their faces light up. Mary, Austin, Daisy, Safia, Joseph and Liam visit The Russets every Friday afternoon and activities usually include a mixture of games and arts and crafts. One particular game that is proving popular with both children and residents alike is the chair game. Tracey explained: “The chair game is where residents and children sit in facing each other in two lines of six chairs and then hit a balloon down the line with a length of foam and into a box at the end of the line. “It’s all about interaction and doing things you wouldn’t normally expect an older person to do. The Russets is the Trust’s 73-bed dementia care home located at its Sandford Station retirement community in North Somerset. The Russets and Sherwood Care Home Manager, Helen Perkins said: “The response to the show was incredible. People from all over the country have been inspired to set up similar schemes at care homes, volunteer for vital services that help older people or just pop in on an older person who might live near them for a cup of tea and a chat. Built in 2007, the award-winning design of The Russets features a ring of five connecting bungalows built around a central clubhouse and scented garden. “The Russets was designed from the floor up around the needs of the people who live here. "This is their home and by making families and children welcome, we are creating an open community, which gives our residents access to people from different generations who will keep them feeling alive and vibrant. To ask any questions about The Russets, arrange a viewing or for more information, please call the Trust’s admissions team on 0800 952 0300 or email carehomes@stmonicatrust.org.uk.